Former Gov. Charlie Crist Will Speak At Democratic Convention : It's All Politics Crist served as a Republican governor, but during a Senate run, he fell out of favor with conservatives. Florida independent senate candidate Charlie Crist and his wife Carole, attend the Election Night Gathering 2010. Republicans have their former Democratic star at their convention this week in Artur Davis — and now Democrats have their answer in Charlie Crist. The former governor and former Republican will speak next week at the Democratic National Convention in Charlotte, the party confirmed this morning. "I'm very pleased, at least in a small way, to try to help the president," Crist told NPR. The new role was somewhat expected after Crist's op-ed Sunday in the Tampa Bay Times newspaper endorsing President Barack Obama for re-election. Once a popular Republican governor in Florida, Crist was on the short list for vice president in 2008 but lost that nod to Alaska Gov. Sarah Palin. In 2009, he had a falling out with Florida conservatives after embracing President Obama's stimulus program. 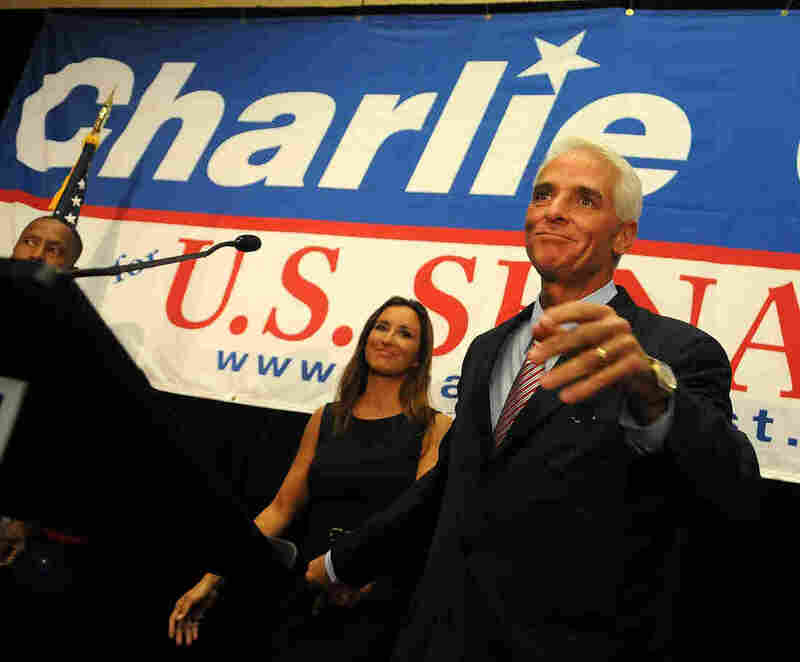 At the time, Crist had been regarded as the frontrunner for the GOP Senate nomination in 2010, but he was challenged by Tea Party favorite Marco Rubio. Falling behind Rubio in the polls, Crist dropped out of the Republican primary to seek the Senate seat as an independent. Rubio won easily. The day and time of Crist's turn at the Charlotte podium is not yet settled. Democrats say Crist's remarks will illustrate the contrast between the economic visions of Obama and Republican challenger Mitt Romney. Republicans say Crist's remarks are all about Crist and his political ambitions. Florida political observers speculate that Crist hopes to run for his old job again, this time as a Democrat challenging incumbent Republican Rick Scott in 2014. Crist on Monday denied any such plan. "It's the last thing on my mind. Not even thinking about it," he said. Davis was a Democratic congressman from Alabama who endorsed Obama early and spoke for him at the 2008 convention. He left the Democratic Party after losing a primary for governor of Alabama in 2010. He has recently expressed interest in running for Congress as a Republican in Virginia, where he now lives.